Your gown is fit for a princess, because that’s exactly how you want to feel on your wedding day. Ethereal tulle ball gowns and floral skirts; soft shades of blush, champagne, or ivory; and sparkling accessories speak to your vision of dreamy romance. Your wedding colors probably incorporate either pink or lavender and you can’t wait to say “I do” in a castle or garden (if you could, you’d get married in Paris in a heartbeat). The more flowers, the better! Accessories that express feminine beauty appeal to you most. You gravitate towards elegant embroidery, a hint of sparkle, lustrous pearls, and romantic XOs or infinity symbols. You probably even are wearing a heart somewhere in your ensemble—whether it’s your engagement ring or a charm on your garter! Today is all about living your dream and marrying your true love. It goes unsaid that you love bling. For your big day, only the best will do—and you’ve got everything from chandeliers to sparkling table runners to fill your wedding with blissful sparkle! Your dress includes gorgeous rhinestone or sequin accents and shimmers with the slightest movement, while your bridesmaids are showcasing sparkly, metallic dresses. Everyone is, of course, wearing jewelry. 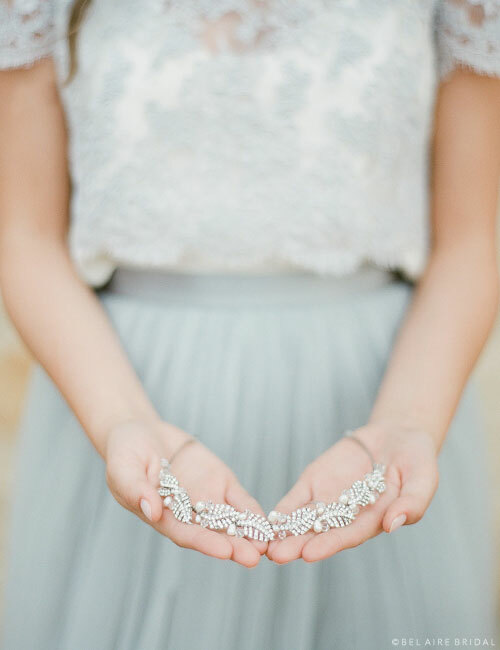 For your wedding, you need accessories with exceptional sparkle. Bold rhinestone statement pieces and glittering accents will transform your look with wow-worthy glamour. You’re the type who must look absolutely incredible on the big day: this is your moment to shine! Your shoes would make Cinderella jealous, but easily the most awe-inspiring part of your ensemble is your engagement ring. Your designer gown includes ethereal layers, illusion or laser-cut lace, lightly beaded straps or soft sleeves, and sleek lines. Incorporating a hint of retro fashion with an updated cut, your wedding dress is totally 2015. You definitely feel inspired by trending styles you see online and plan to incorporate fun flair into your wedding! Your accent colors probably include blue, mint, or grey, and you love the idea of an outdoor ceremony. Accessories that appeal to you are chic and modern. You like mixed components, gorgeous sparkle, and red-carpet style. One thing you don’t want is to look like your grandmother; but you wouldn’t say no to a veil like the one worn by your favorite celeb bride! Choose jewelry that flatters your fabulous gown and makes you feel like yourself, on your very best day. You sourced your gown from a second-hand shop, modified your mother’s wedding dress, or found a design that features old-fashioned elements. Perhaps incorporating elaborate lace or plenty of buttons, a high neckline or short skirt, your gown is nothing if not iconic! You love thrifty finds and have a penchant for unique styles from past decades; current trends are irrelevant. Geometric designs and an Art Deco theme totally appeal to you—and your perfect wedding is at a museum or historic house. You’d love a tea-party reception or all-night jazz. Accessories for your wedding are retro, vintage, or a bit of both! From steampunk gears to perfectly proper pearls, you can’t help but love old-fashioned, charming details. Go for vintage-inspired rhinestone designs, a bold pearl necklace, or an intricately beaded belt and purse. Accent pieces will tie together your whole look. 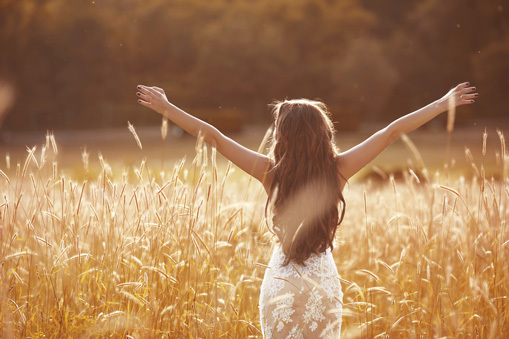 Your dress is light, airy, and moves when you dance. Whether you went for a casual crocheted sundress or a fairy-like organza gown, you prefer a more natural look for your wedding day. A bit of sparkle infuses your ensemble with magical beauty; you love the idea of delicate crystal pins, dramatic rings, or bold metallic bohemian hair jewelry. Your dream wedding location: the beach or mountains, unless you’re hosting a backyard ceremony. Accessorize to express your personality. Anything with flowers or leaf motifs probably appeals to you, and you’ve definitely considered a fresh flower halo for your hair. 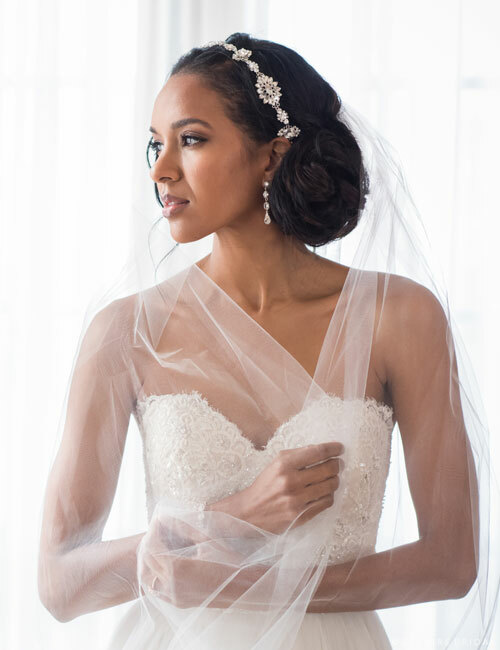 A dreamy veil that you can wear for the ceremony and remove later is right up your alley! Keep an open mind, and explore different designs to create an outfit unique to you. Your wedding dress is timeless. When you look at your photos in ten years, you’ll love the gown just as much as you love it today—with figure-flattering, clean lines, it makes you absolutely radiant. Of course you’re wearing a veil, and it probably has a beaded, lace or ribbon trim to complement the dress. You’re getting married at a church (possibly on your parents’ or grandparents’ anniversary) and want to incorporate a bit of something blue into your ensemble! From the flowers to the centerpieces, everything is coordinated to look simply bridal. Accessorize to enhance your whole wedding look. Conservative rhinestone and pearl designs will best suit your style; consider finding a matching jewelry set for a more polished, put-together ensemble. The focus today should be on your natural beauty, but a few finishing touches will help you look and feel your best! Consider splurging a bit for bridal jewelry you’ll love and can wear again and again.